The art of water rangoli designs dates back to Mahabharat times. So this art has a long history and with the advent of time there are plenty of ideas which can be used to decorate your space. 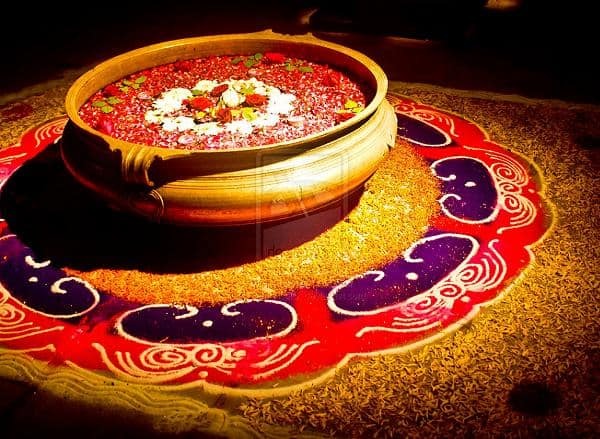 Here are 20 best water rangoli designs that can help you to design a unique rangoli art. 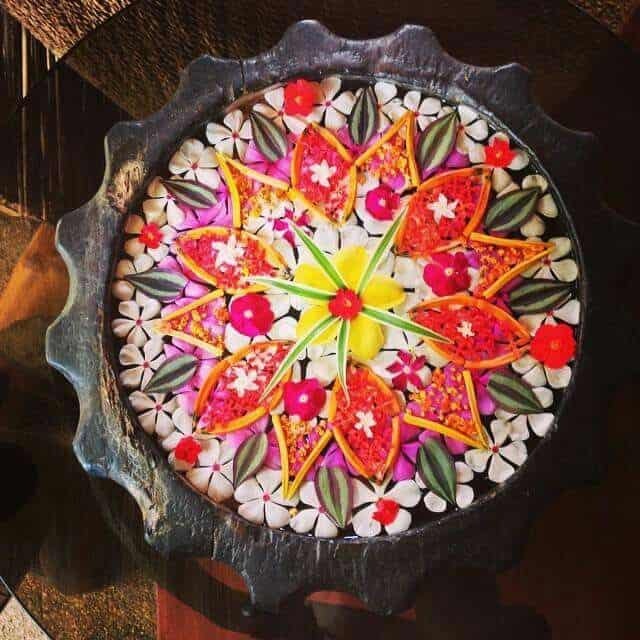 1: You can make this beautiful water rangoli art by using colorful flowers as they are light and will easily float in water. 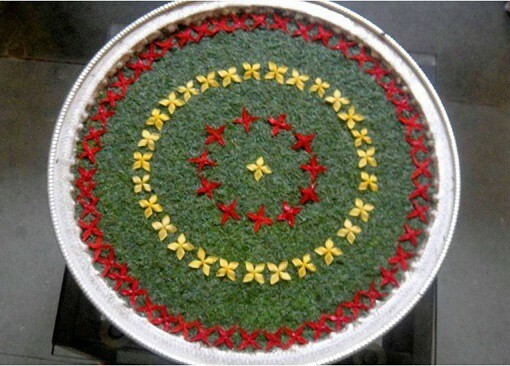 You can also use petals and leaves to decorate it. Colorful flowers look more bright when kept in a vintage bowl. 2. If you want to give your rangoli a dramatic look you can try this one. 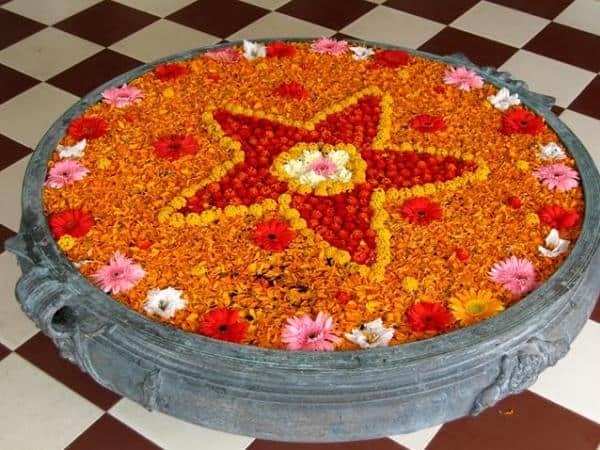 First make a beautiful rangoli and then you can keep a decorative container at the centre. 3. You can try some innovative patterns by the help of OHP sheet and beads. These transparent OHP sheets can be drawn into beautiful flowers. 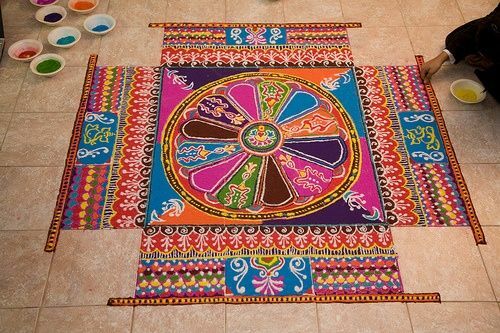 It is one of the easiet way to create water rangoli designs. 4. 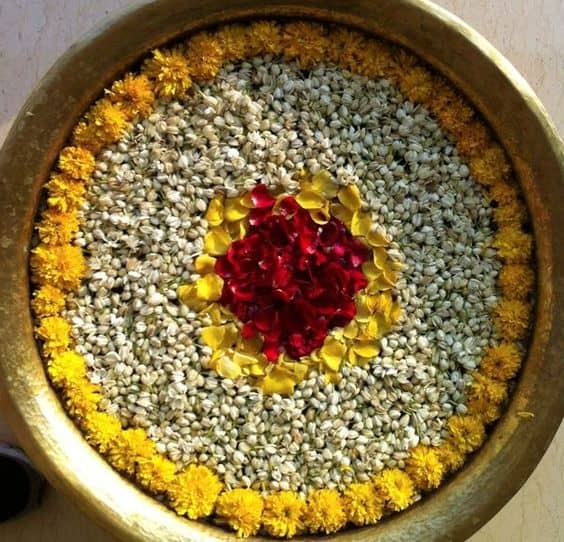 You can use tiny flowers to create water rangoli in a moment. This is the simplest form of rangoli one can try. 5. 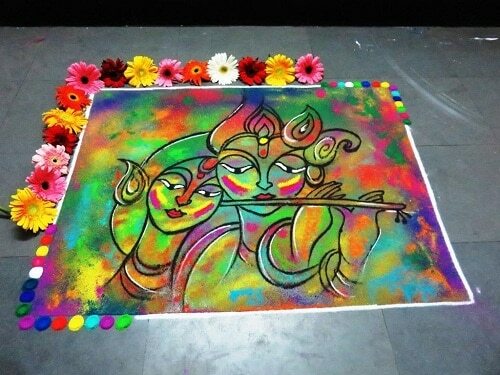 To create water rangoli using colorful powder one need to spread some oil in the surface. It will keep your design intact. 6. You can also use decorative items made up from thermocol. They help in making beautiful patterns at the surface. As they are very light and can easily float in surface. 7. 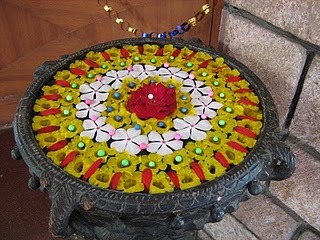 Since water rangoli are made in a container so they can be easily placed anywhere inside the home. 8. 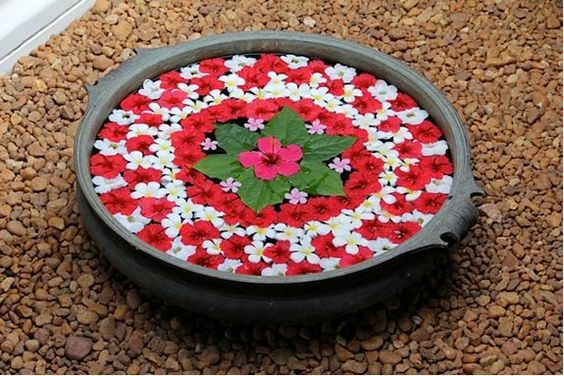 You can experiment with different containers and make water rangoli in round plates and tray. These small plates can be kept in the centre of the table. 9. 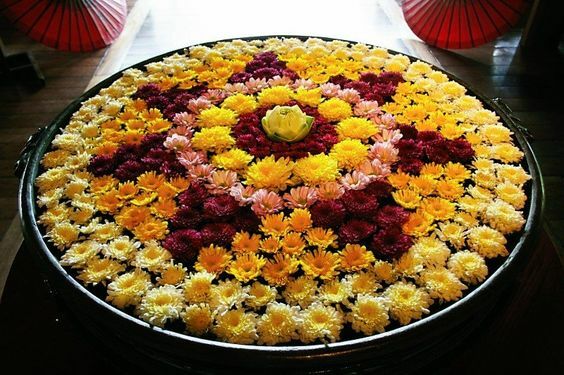 You can use different variety flowers to make an attractive water rangoli designs. 10. 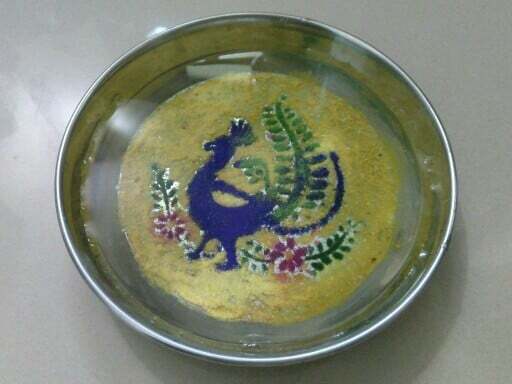 These water rangoli can also be made in big metallic pots and can be easily placed anywhere. 11. 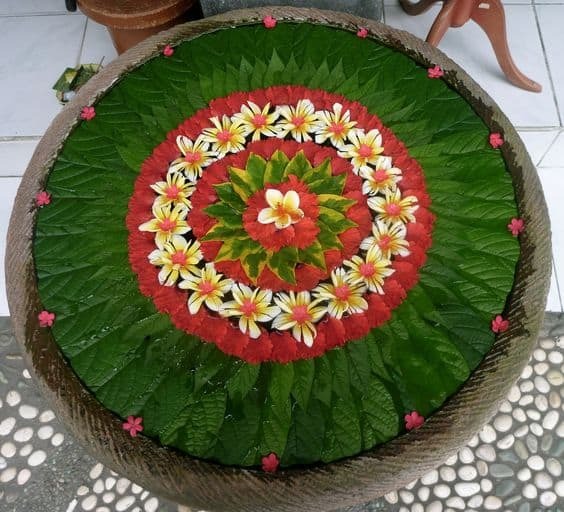 If you have scarcity of flowers then you can also use leaves to make attractive water rangoli. 12. 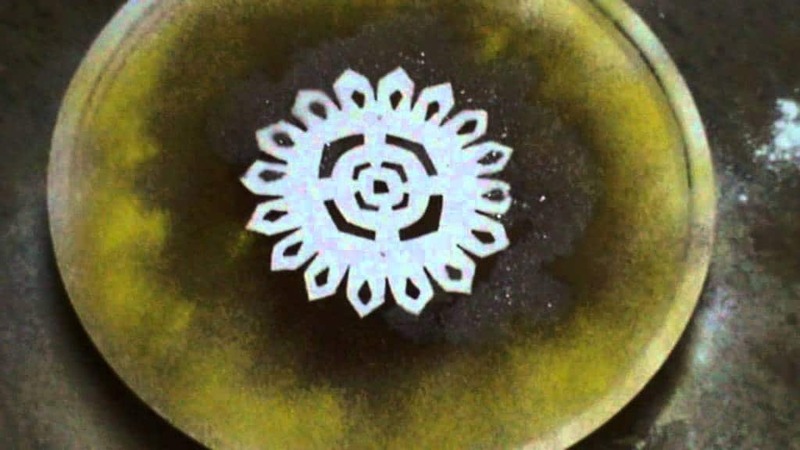 This shaded effect rangoli is quite easy to create in container filled with water. 13. 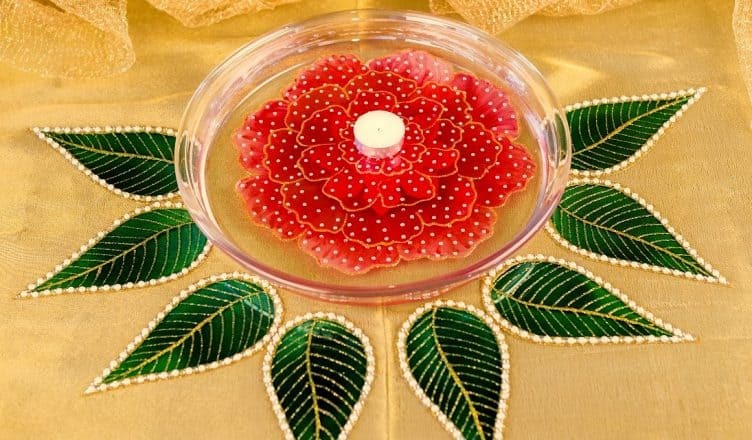 You can also make bits of leaves and use it to fill the gap in the water rangoli. 14. 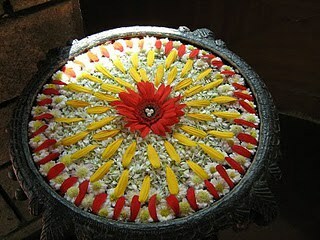 Instead of going for a simple rangoli design you can try this creative style. 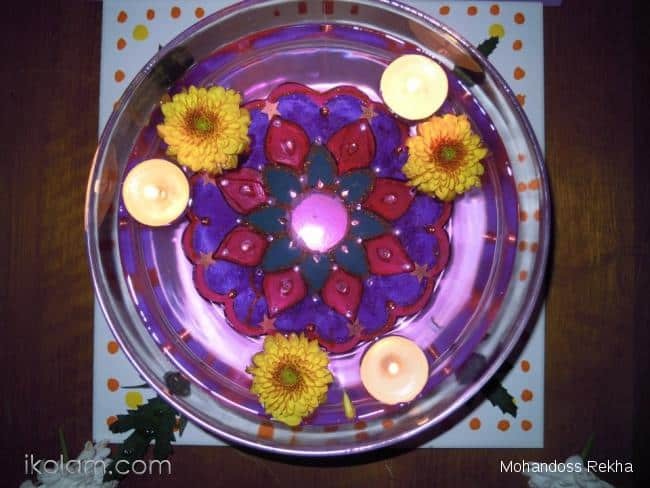 To make it you will need a container in which you can make water rangoli. You will also require earthen lamps, flowers and powdered color to complete it. 15. 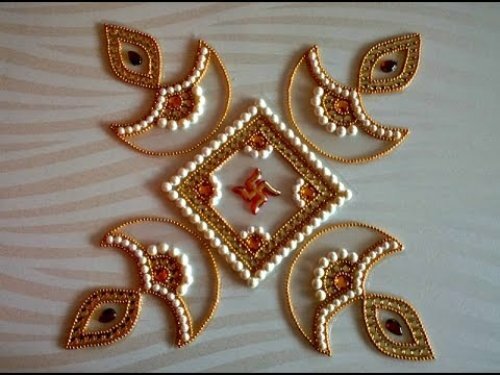 You can use glitters, golden dust powder and beads to make it more attractive and sparkling. 16. 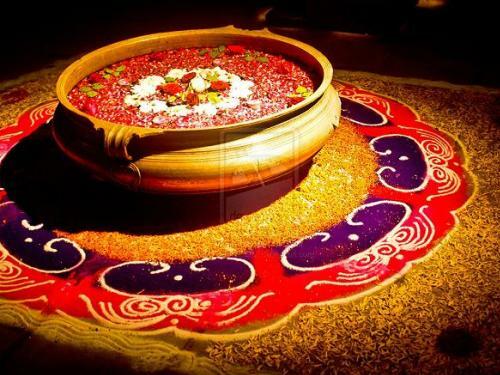 The other creative way of drawing water rangoli is by painting a colorful design in the plate. Then afterwards you can fill it by some water . 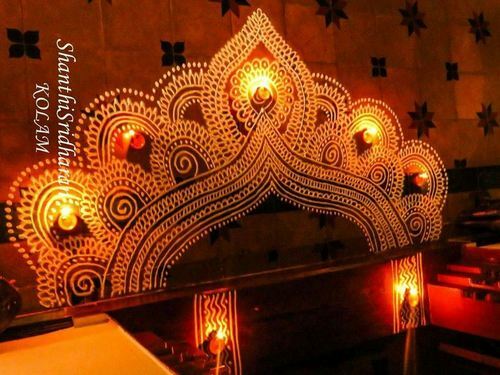 You can also add some floating diyas to it. 17. You can use small bowls and draw traditional motifs in it. 18. 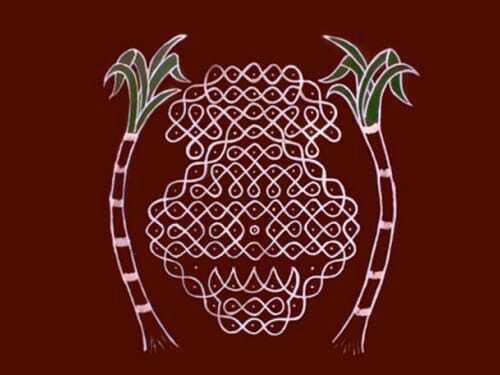 You can also draw your favourite Kolam design in it. 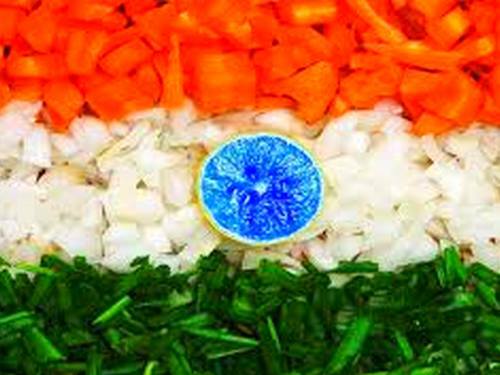 To make it look more attractive use color contrasting to the utensils. 19. 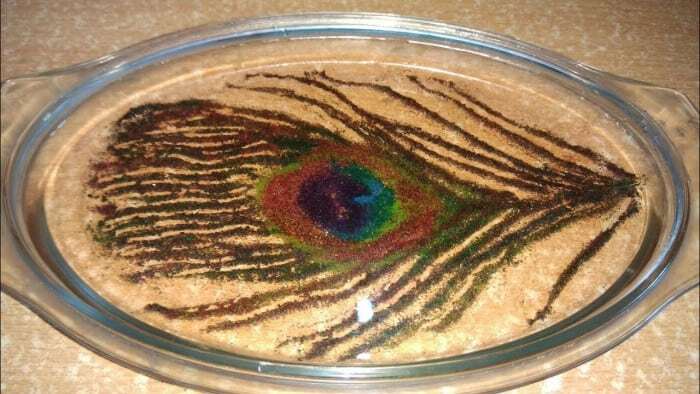 Beautiful peacock feather design created in oval shaped tray. 20. If you want to create design using white color then first try to make a background using dark color. Once you are done with your background then complete your design. 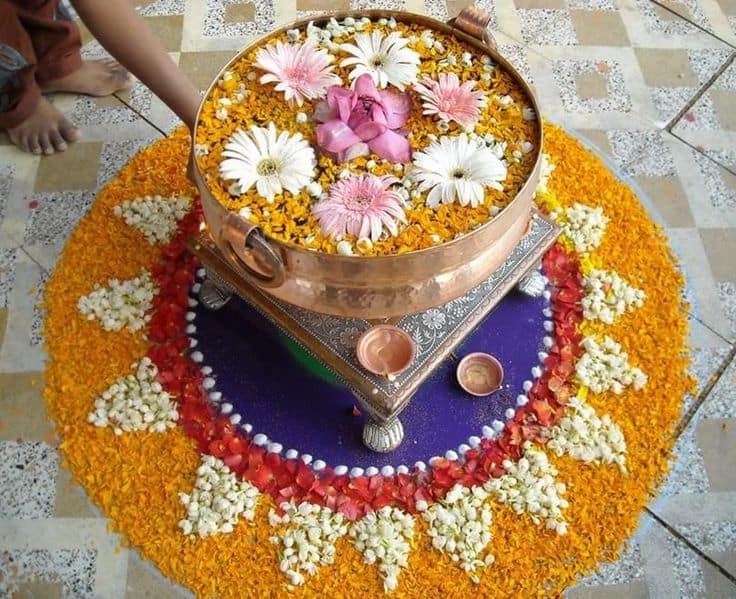 Do share with us which water rangoli idea inspires you and which one of the above attracts you the most. Also have a look at these beautiful Kolam rangoli designs for Pongal.